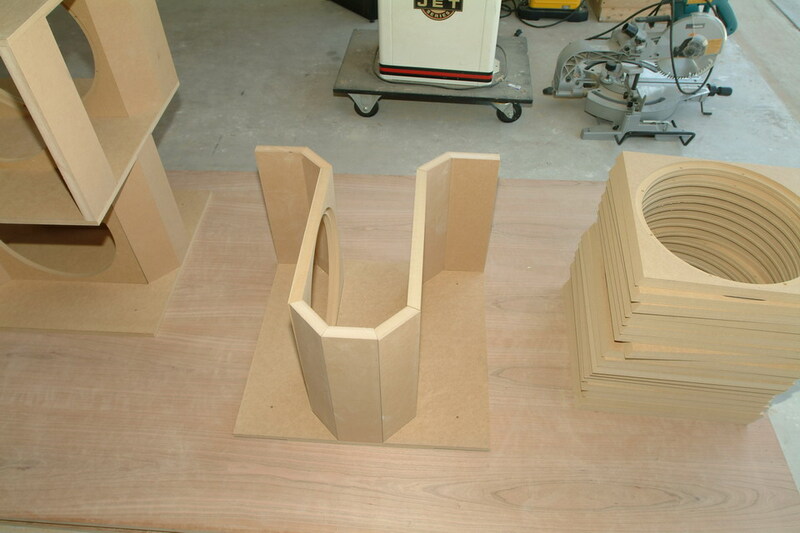 An Ultra-Low Frequency subwoofer is in the design stage. While it is widely accepted in the industry that non linear distortion at low frequency is not particularly audible I am convinced that it is audible. In fact I believe that non linear distortion is the most audible at low frequency. One look at the equal loudness curves of human hearing should convince anyone that non linear distortion is least audible above about 3 KHz and most audible below 3 KHz. Above about 10 KHz it should be completely inaudible because the 2nd harmonic is exceeding the human hearing range. At 20 Hz the human ear will hear an equal level 40 Hz tone as 20 dB louder based on a 90 dB reference level. This means the 40 Hz harmonic must be 20 dB below the 20 Hz fundamental just to sound as if it is the same level or 100% 2nd harmonic distortion. It's very difficult to achieve low distortion at frequencies in the 20 Hz range. Consequently I wonder how test were conducted to produce the widely held belief that distortion is inaudible at low frequency? Since most woofers produce at least 10% distortion at 20 Hz which sounds like 100% distortion at the 2nd and far higher at the 3rd, they have no clean reference to determine if induced distortion is audible. The test platform is starting with too much distortion to begin with for anyone to assess that an induced distortion is or is not audible. So, the design goal of the woofer system for the theatre is to minimize non linear distortion. This means starting with a low frequency driver that can produce low distortion. I have chosen the Dayton Audio RSS390 HF 15" woofer from Parts Express. It is the lowest distortion woofer I have yet encountered. Hopefully someone will e-mail me data supporting a better solution. 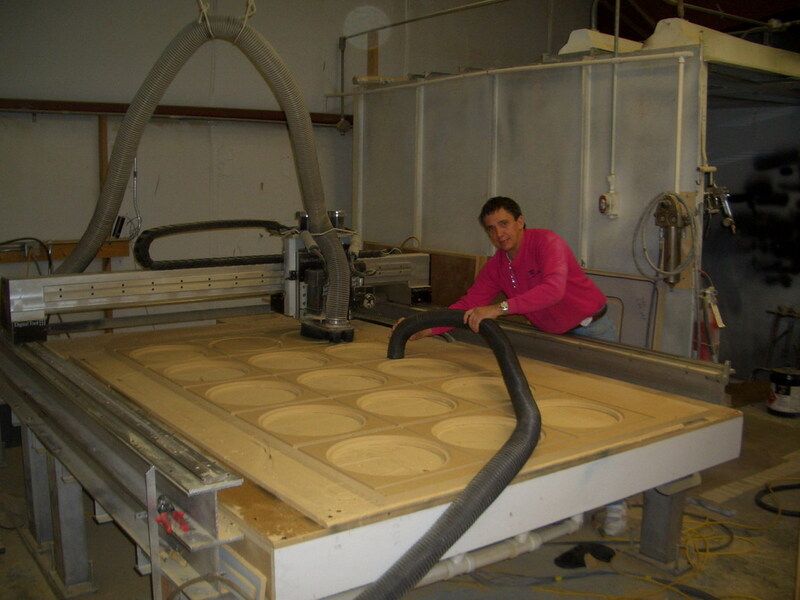 8/24/08: The woofers are fully operational with all twenty four 15" drivers playing! You should hear (feel) the canons on the Telarc version of the 1812 Overture! Pretty spectacular! One of the issues with mounting a bunch of large heavy cone woofers in an H-frame or similar open baffle is that the mechanical energy in the frame transfers into the baffle causing a lot of vibration. 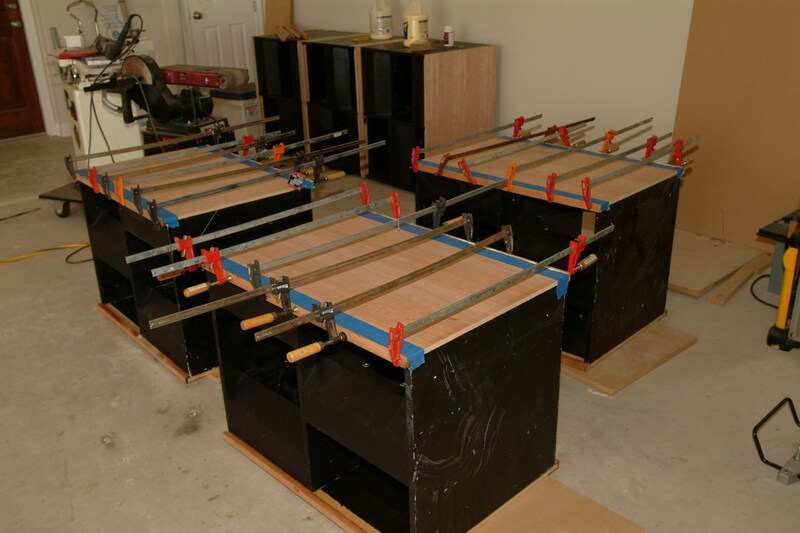 To overcome this I have mounted the woofers in opposing pairs so that the energy in the frames will be canceled. 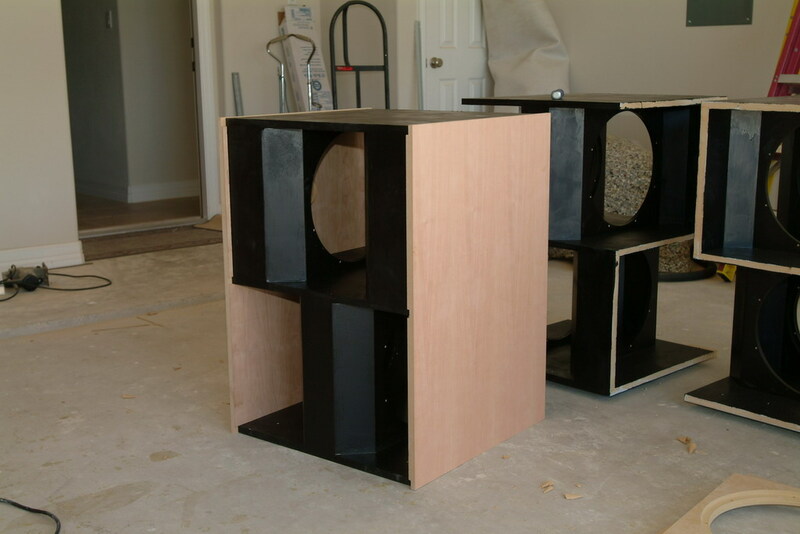 A better way to mount the woofers would be to rigidly mount them to each other such that they press into gaskets in the baffle boards but do not rigidly mount to the baffle. This would eliminate the frame energy more efficiently but would make mounting the woofers considerably more difficult. Therefore I have mounted them more conventionally by simply bolting them to the baffle boards. This still eliminates most of the vibration. This design does however induce wind noise at low frequency. 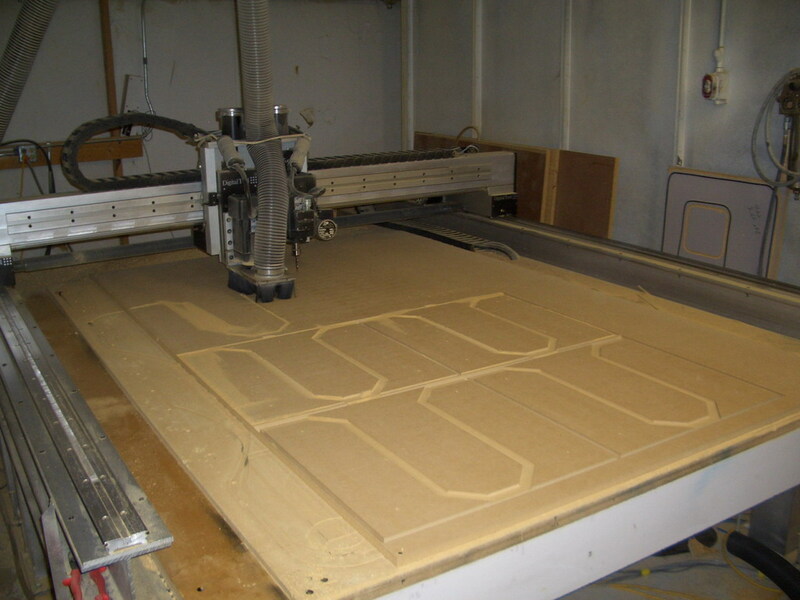 Ultimately the best design will be a large radiating surface with no obstacles to generate noise. 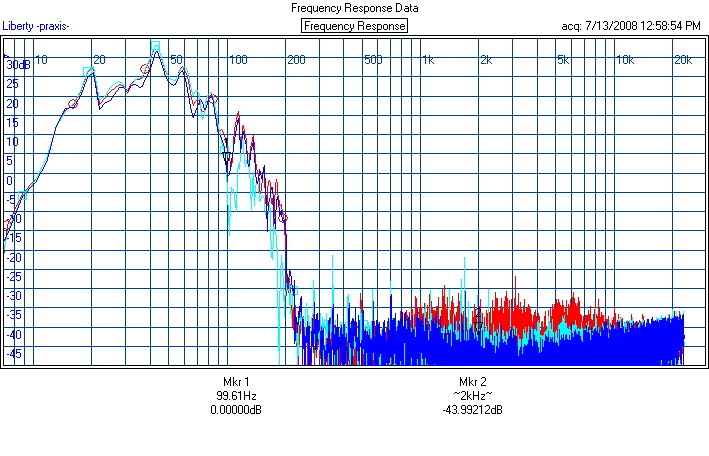 Note that the 2nd harmonic is more than 41 dB below the 18 Hz fundamental. This is less than 1% distortion which will sound like about 10% due to the human hearing curve. 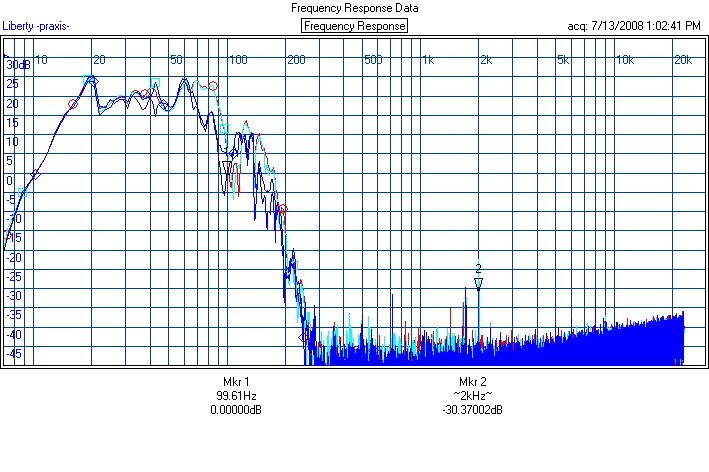 The 3rd harmonic is about 36 dB below the fundamental which is about 1.5% distortion. This will sound like about 100% since at this frequency the human ear hears 54 Hz tone about 35 dB louder than the 18 Hz fundamental. Clearly it's still not good enough! 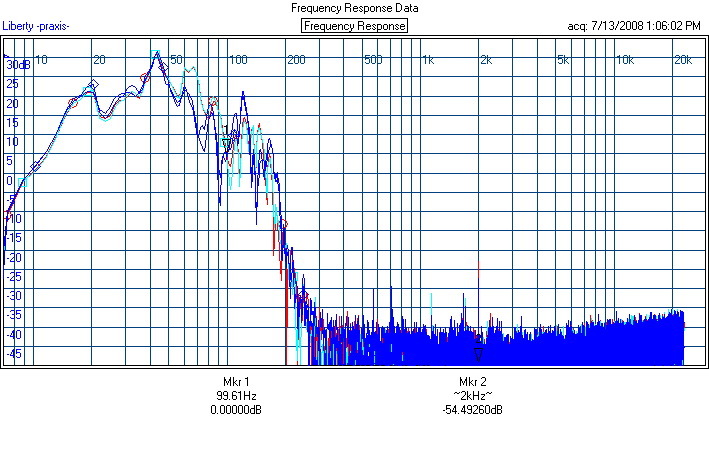 In order for the 3rd to sound like it is 1% it would need to be about 75 dB below the fundamental. We're going to need a new technology to accomplish this and to finally have a clean reference adequate for induced distortion test to finally determine if distortion at low frequency is or is not audible. Another issue with bass performance in a room is caused by the room itself. Room modes can cause peaks in the response that can vary depending on the listening position within the room. This can make subwoofer placement challenging. Often times it's near impossible to find a location for the subwoofer that will produce good results at every listening position. These room modes can also impact distortion by varying degrees of constructive or destructive addition at the fundamental relative to the harmonic. Based on a listening experience in the home of Brian Elliot in CA I concluded the best solution for uniform bass distribution would be to use two infinite line (floor to ceiling) columns with one sitting on each side of the theatre. This has proven to work very well especially moving across the listening area side to side. 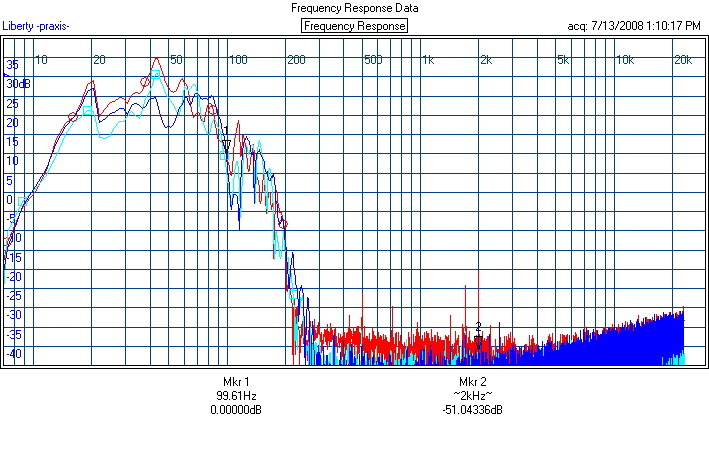 The above frequency response graphs are over-plots of each row in the seating area. As you can see within each row the plots overlay almost exactly. Moving side to side within the listening area produces almost no change in the bass response. This will make equalization an easy matter as correction at any one point corrects for all points within the row. Moving front to back however is a different story. The red line above is the center of the back row. The light blue is the center of the front row and the dark blue is the center of the center row. 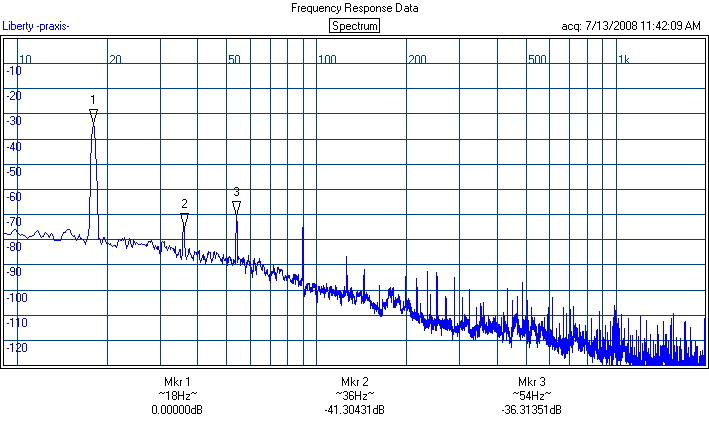 As you can see the front and back rows have almost identical frequency response but the back row has about 5 dB higher output. The center row is similar to the other two rows with the exception that it does not have the 43 Hz peak that exist in the other rows. This will result in a dip in the response in the center row as I would rather live with that dip than continue having the peaks in the other rows. Other than this and other than the 5 dB delta between the front and back row it will be possible to equalize the response to be very flat across the entire listening area. 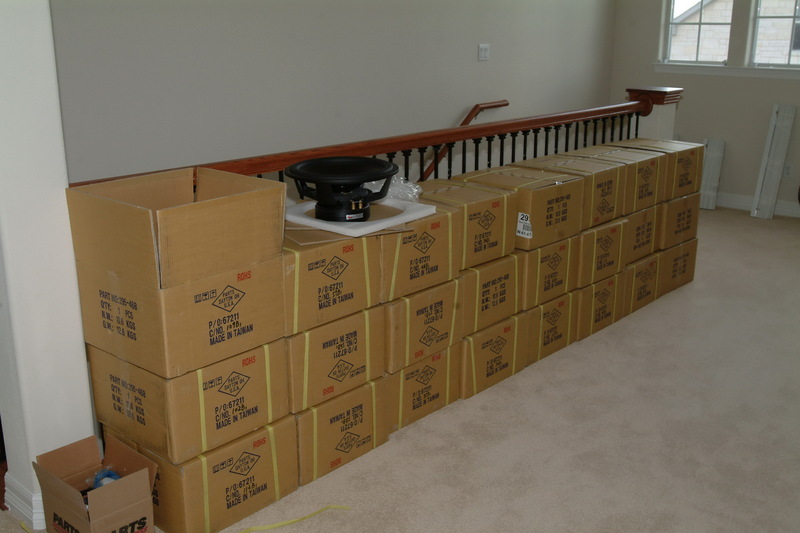 This is next to impossible using the conventional approach of putting a "box" sub-woofer system in a corner of the room. So while the over-plot of the three rows proves that the bass distribution is not perfect, it does show that it is much more uniform than using a conventional subwoofer. With this system it appears bass response across the entire listening area will remain easily under a 10 dB window. I believe that once the main speaker system is finished it will be able to improve this slightly in the 40 ~ 50 Hz range. I believe in the end the bass response will be within about +/- 3 dB from any one listening location to any other. With a single conventional sub, +/- 10 dB or more is not uncommon. 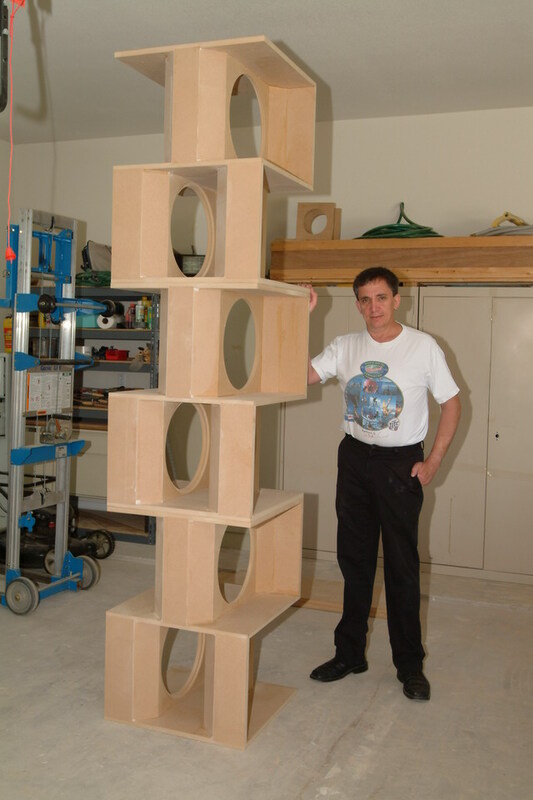 Total cost of construction of this woofer project will be under $4000.00. While this is not particularly a low cost sub, I believe it will be at a cost/performance ratio that is unparalleled. You can certainly get a lot less for your money commercially. I'm not sure what this would retail for if it were a commercial product but it would certainly be many many times the cost of construction.